May | 2013 | HowDoYouLandscape? This year the chair of Landscape Architecture of the Delft University of Technology is for the third time annually contributing to Oerol. The project, named “Landscape Architecture ON Site, Being Part of Oerol 2013,” will be constructed on the festival site – the island of Terschelling. The aim of the project is to express the landscape of Terschelling in a landscape architectonic installation or research-guided methodology. 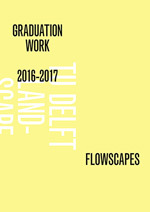 We, the tutors Denise Piccinini and Michiel Pouderoijen, are currently working with a group of twelve master students of different backgrounds at the TU Delft Faculty of Architecture. In only a seven-week period, the students will finalise their schematic designs for construction on the island of Terschelling. At present, we have thus far selected the strongest concept fabricated by the students for further detail development. For the 2013 course agenda, we have adjusted the design process by structuring it into three main phases and a conclusive reflection. The introductory phase is about reading and discussing concepts and examples, comprising a field trip to explore the site and a more rational investigation in the atelier. On the first day of the studio, students were immediately confronted with some notions involved in this specific project for Oerol including aesthetics of art, crafts, temporality, interaction with the public, use of natural or artificial materials in relation to nature, being part of a building process, and methods like “learning by doing” implicit in the act of making. These preliminary days were instructive and critical to introduce the main themes of the project and construct a framework of references. During a three-day introductory field trip to Terschelling, the context and identity of the place was defined by students mainly by sensory perception. Throughout the site visit, we made several bicycle excursions on the island and visited the possible site locations for the project. Additionally, students executed short brain storm sessions in the depot of Oerol. The main idea was to make a definition of place by experiencing it through the senses and by searching for the natural patterns, materials, and stories related to it. At the same time, students and teachers became acquainted with each other, with the island and with its inhabitants. These first impressions and experiences from the excursion to Terschelling were the starting point for further investigation in the atelier in a more rigorous manner, where students went on studying and deepening some aspects they have found on site like the morphology of the island, the tide, wind, vegetation, etc. Experience of the place and results of the research formed the base for the project, which puts specific aspects of the landscape on stage at the Oerol festival. The second phase consists of the development of concepts and materialization. Experiences and ideas generated during the field trip and studies in the atelier have led to several concepts for an intervention in the location that creates or enhances a ‘sense of place’. These concepts were explored and developed in small groups which were constantly changing to generate as many ideas as possible. It is important to emphasize the fact that during the process the students were not working on one’s own idea through the end. Instead they were working on several ideas at the same time, since just one concept will be built during the festival. This method we introduced to avoid individual authorship, considering the production of concepts as main objective. During these weeks several workshops were held with guest artist – Erick de Lyon, Paul de Kort and Irene Fortuyn – to boost new inputs and possibilities. This was the time to generate as many ideas as possible and check them and to try to step over the own limitations, reaching the unexpected. By inviting critics to give input and review the work, the students’ progress the ‘research’ on the different sites and themes in an informed way. We are now into the third phase where the concept to be built is chosen and has to be further developed and planned. The choice for the concept to be built is made by Mariska Verhulst, project manager of Oerol, and the tutors this year. The chosen concept has evolved during the design process to an open and complex system where several of the other ideas the students have developed so far can be included. It mirrors a process we have been through proposing a design as process instead where the visitor plays the main role pointing out them favourite places on the island and handing the essence of the place in a test tube. It certainly has a potential to be explored not only this year but also in the years to come due the fact, as already said, it is a process starting this year with a inventory an experiments on several sites. The project has already got a name and a web address – The Institute of Place Making – www. iopm.nl. The institute finds out and makes visible what the notion of place is about and how it evolves. It will do this by mapping, categorising and analysing feedback of visitors on their experience with Terschellings’ landscape and places. The results will be returned to the visitor through a website, and each day of the festival on a fixed time a manifestation will be held by us in a different location indicated by the visitors’ feedback. One of the results will be a map of the island with the values visitors endow to the locations on the island they visit. Another result will be 10 pop-up manifestations, once a day mostly reacting to the Genius Loci of the place. It all will be registered and documented on our website. During the festival, the institute will be located near ‘Duinmeertje van Hee’.